Book Description: This text is designed for use in a Evidence course as a stand-alone chapter. Specifically, this material covers FRE 410. Federal Rule of Evidence 410 was an attempt to codify common law precedent finding that withdrawn guilty pleas, pleas of nolo contendere, and offers to plead guilty and nolo contendere were inadmissible against an accused. 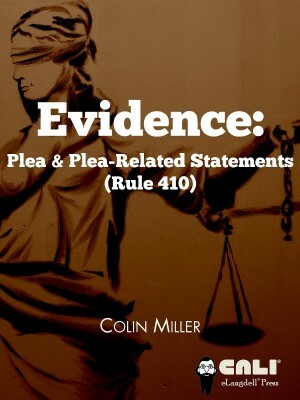 Evidence: Plea & Plea-Related Statements (Rule 410 by Colin Miller is licensed under a Creative Commons Attribution-ShareAlike 4.0 International License, except where otherwise noted.